This Cheeseburger soup recipe will be just in to satisfy both your nutrition requirements and demanding taste buds. Yes, that’s exactly my shout-out for today. Truth to tell, before trying out this cheeseburger soup recipe, I thought I had known literally everything about soups. And then there it came this cheesy little thing. It’s a sure thing to say that soupy dishes have been around for quite a time, East to West. Hence, the unlimited creativeness from chefs and food lovers for soups just keep on gathering cross-culturally. Up to this day, this significant kind of comestible is still on its adventure to new cuisines, satisfying each and every strict food critics’ grand demand. Now, I know you may wonder, is Cheeseburger Soup the combination of CHEESE, BURGER, and SOUP? 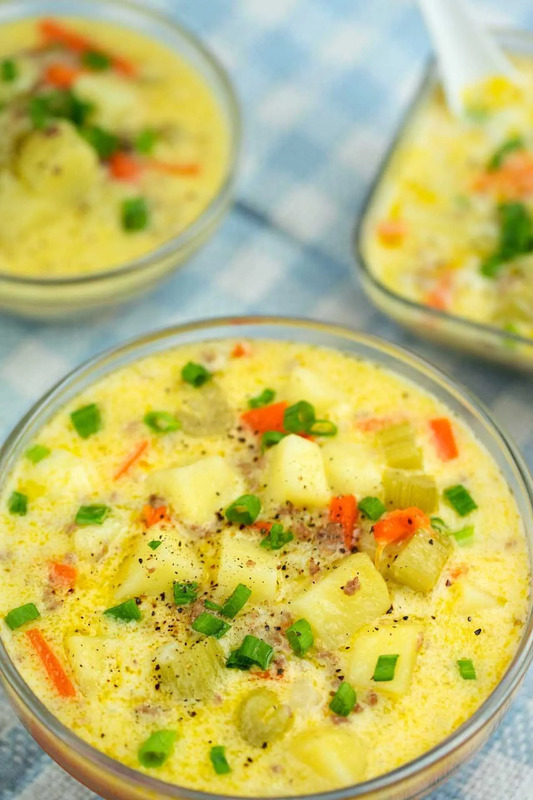 First appearing in a Danish kitchen, Cheeseburger Soup is actually a well–established repast of the American cuisine. The dish originated from the traditional cheeseburger with similar main ingredients, but cooked in liquid form. It is then modified and spread out phenomenally on American LCHF blogs. So yes, I know how fatty-greasy-like it sounds. But please stay assured that we’re walking the cheeseburger with no resemblance to any Mc’s cheeseburger. It’s literally no canned, no processed-to be forthright. Other than beef, cheese and bacon, a bunch of veggies with colors is also added. Just take a look at the ingredients below, and you’ll see how this dish could outsell just any cheese-made store-bought available. What can you do with Cheeseburger soup? That’s an easy one. Scoop them out directly and just serve. Come on, I mean – what is soup presented for? Too plain and need some team-up for moreishness? You may want to give flatbread and pita bread a whirl. One amazing thing about this hearty curry is that it’s incredibly easy to have some swaps. I actually had some hot steaming rice and they worked together just smooth, fyi. Additionally, you can top some roasted veggies for extra flavor burst too. If any of the above just sounds too identical to you, then I may suggest crispy tofu croutons to be that dang thing in lieu of typical rice or bread. Since the dish already tastes so rich with that thick and toothsome feeling, it’s pretty legit that bubbling freezing drinks are to be welcomed. In this case, try out iced ginger syrup, tomato-spearmint cocktail or Sauvignon Blanc. Well I didn’t do these, to be honest – I was just a bit sluggish at the moment to put it together properly (yuck me). But it sounds like it’s worth having three fingers lifted, doesn’t it? It happened when I came across this Cheeseburger Soup on a menu at a famous local restaurant. I was immediately intrigued back then. Come on, who hasn't been through that phase being a soup-addict once, ever? And that curiosity-triggering name, gawd. I just had to try it out. In a large pot, melt ½ tbsp butter over medium heat. Sauté all the veggies until tender, then stir in the beef to well-done. Add chicken broth and potatoes to a pot in turn. Bring them all to a boil, then let simmer until the potatoes are mushy (approximately 10-12 minutes). Melt the leftover butter and stir in flour. Pour in the milk and keep stirring until they're all well-married and the texture is just smooth. Pour the mixture above into the chicken broth with potatoes. Bring them all to a boil and reduce heat to a simmer. Stir in the Cheddar cheese until melted, then add sour cream and just heat through (please be noted to not give it to a boil). There you have your Cheeseburger Soup. Now, remove the soup from heat. Pass it to bowls and serve immediately while it's still hot. Remember to keep the cubed potatoes at a cool place to retain their freshness pre-cook. To prevent the soup from curdling, remove it from heat before adding sour cream. I love the wholesome, natural ingredients! Such a hearty, delicious soup! I’ve never made or tried a soup like this. I’m so intrigued and it looks so incredibly delicious and nourishing. It’s on my list! Love it! Tell me what you think when you try it! Thankyou!